Lighting and electronics specialist HELLA has worked with Covestro, one of the world's largest polymer manufacturers, to develop an industry-first holographic rear-lighting system with 3D effects for passenger vehicles. A show car demonstrating the new holographic system was shown for the first time at a recent trade show in Duesseldorf, Germany. Front lighting featured a seamless, continuous light strip running across the entire front of the vehicle. HELLA and Covestro have worked together since 2012, pooling their knowledge of electronics, lighting and plastics technologies to develop innovative designs for front and rear automotive lighting. The unique rear lighting system is based on a lamp with three parts, each equipped with holographic technology. Designers at HELLA developed each hologram. Covestro then incorporated the designs into a transparent holographic film and laminated the film onto a 3 mm glass plate. In the future, production applications would use plastic instead of glass. "Holographic films are perfectly suited for integrating different lighting functions into the body of a car in space-saving, unobtrusive ways," said Dr. Michael Kleinkes, head of Development Lighting Technology at HELLA. "The installation depth can be reduced and auto manufacturers will have the ability to install lamps that are more compact in size." To create a 3D effect, the holographic film is illuminated from behind by LED light sources and reflectors. The outer elements of each lamp feature numerous holographic "flakes." Integrated into the tailgate is a middle lamp on which the HELLA and Covestro logos appear to be floating. Instead of a high mounted stop lamp, the rear stop lamp and center high mount stop lamp are combined into a unique single unit that sweeps across the entire rear of the vehicle. "With all statutory regulations met, it would be possible to implement this approach in series production almost immediately," said Kleinkes. 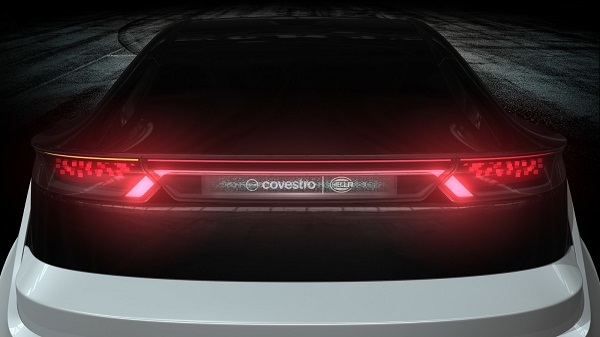 The vehicle's tail lights are visually combined with the direction indicators, or turn signals, using a diffuser film with diffractive optics developed by Covestro. The diffuser film forms and distributes uniform light beams with a minimal loss of light. Bi-colored LEDs generate rear turn signals and tail-light functions. Sequential turn signals are also possible with the vehicle's LED light system. HELLA and Covestro created seamless, uniform front-surface signal lighting for the vehicle as well. Signal functions are generated by a three-part EdgeLight light guide that spans the entire front of the vehicle as a continuous strip of light. The two outer parts of the light guide create the direction-indicator lights, as well as daytime running lights, which also can be dimmed to position lighting. The middle light guide is responsible for the continuous daytime running lights and a position light signature. Both functions can be animated. The area in front of the vehicle is illuminated using four ComLED modules. The two main lighting functions of low beam and high beam lighting are executed by the matrix HD84 module developed by HELLA. LED displays are integrated into both the front and rear of the vehicle to enable additional animation, such as a welcome light function. In the future, additional safety or convenience displays could be created to improve the driving experience, both while the car is stationary and in motion. For example when braking, it might be possible to illuminate the rear lamp with a message such as "STOP."